A stray cat enjoyed a $1,000 fish feast at Russia’s Vladivostok airport, after managing to get inside a delicatessen fish counter, it’s reported. 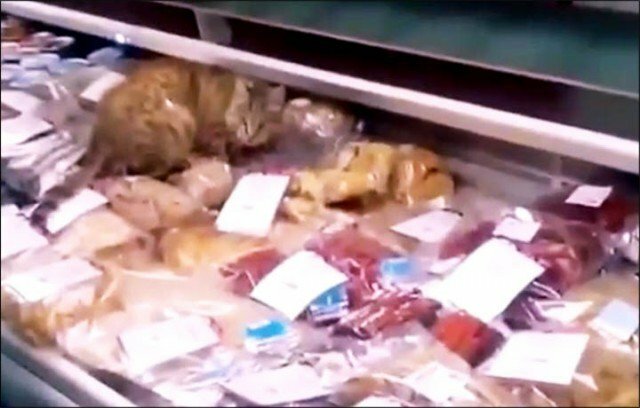 The cat was filmed by staff at Vladivostok airport, helping itself to marine delicacies including squid and dried octopus, the PrimaMedia.ru news website reports. The animal was seen scrabbling at packaging and happily munching away on the contents. It was a costly break-in for the store’s owner, who had to bin the entire contents of the fish counter, worth about 60,000 roubles ($1,000). Nobody knows how the cat managed to get into the store, although according to airport staff it’s a local stray and sometimes wanders into the airport. It seems the cat is now a minor celebrity, with “fans” lining up to visit the scene of the crime. “Our staff practically can’t work because of the flow of fans,” Irina Kuzmina, the shop’s owner, tells PrimaMedia. Some members of the public are concerned about the cat’s fate, because it hasn’t been seen since being busted mid-meal. The airport has received letters from dozens of concerned people offering the animal a home, the website says.